Five vegetable planters were made from plastic drainage pipes and wood pallets. Spare and unwanted garden tools were donated by project staff to encourage reuse of materials. Vegetables, herbs and flowers, such as tomatoes, mint, sunflowers, were planted in the garden by children from the Springhallow School (a local special school for pupils aged 4-16 years with a diagnosis of Autism). The children also planted and took home individual sunflower pots. A rainwater harvesting system was installed and used for watering the gardens. The gardens were maintained by a number of staff who have volunteered to regularly water and weed them. In addition to this, the project purchased three food waste processors called Smart Cara, a way of disposing food waste. 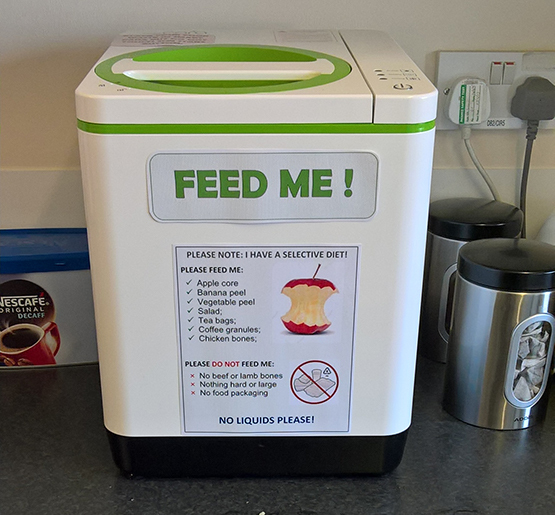 Leftover food waste produced in the office is placed in the Smart Cara. The food waste is heated and grinded (to one tenth of its weight) to produce a soil enricher. The low energy food waste processor runs on just approximately 250W of energy per month. The soil enricher produced from Smart was mixed with compost and used for planting the vegetables. reducing carbon emissions through onsite food waste treatment and reducing the number of waste collections required. The scheme was also highly commended in the Great Western Railway Sustainability Award and won a Green Apple Award in 2017. It is vitally important to protect the natural environment, avoiding the destruction of habitats and pollution of the air, land and water. Providing a positive experience for the community helps improve the overall image of the construction industry and demonstrates that you care about the local environment. Homes for people and Swifts too?